As a kid I remember asking my parents what “No Vacancy” meant and they told me that it meant that there were no rooms available to rent. Well, we are close to putting up a “No Vacancy” sign here ourselves. Lisa ( a friend of Natalie’s) form Lehi, UT and and her sister Laurie came to stay with us and we enjoyed their visit. 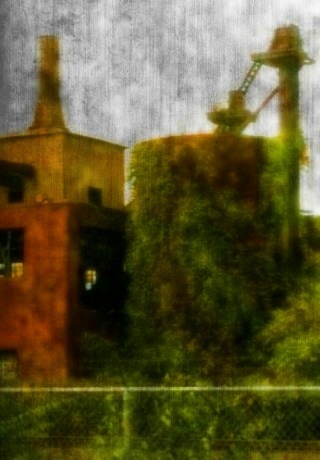 By the way, the above picture is that vine covered tank, shot with my iPhone, and then edited with various iPhone Apps. This entry was posted in Beckwith Mansion & Estate, Latter-day Saints, New York, Palmyra, New York and tagged 2009, Autumn, Beckwith Mansion, Brent, Brent Walton, California, Church, db walton, Estate, Latter-day Saints, LDS, Missionaries, Mormon, New York, Palmyra, photographs, photography, Tuesday on September 29, 2009 by dbwaltonm. 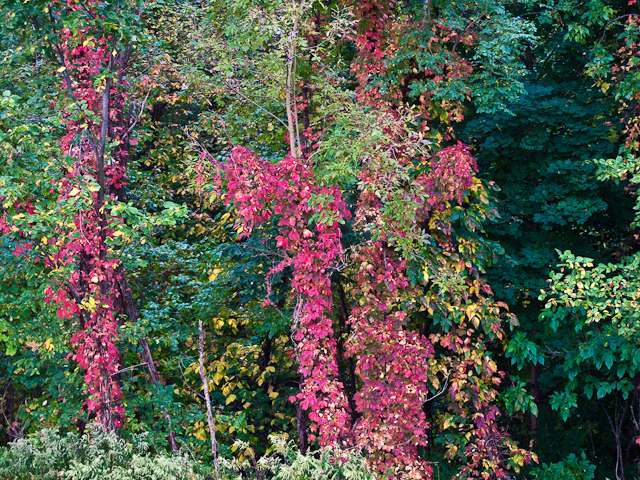 My guess is, that is probably poison ivy growing on those trees, but who cares. 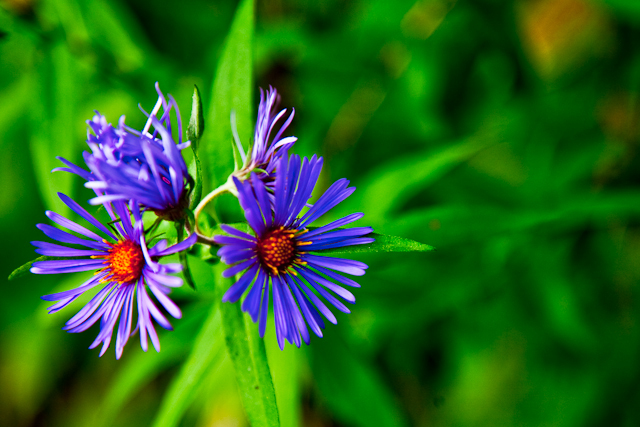 Look how pretty it makes the road side look. This is on SR 31 just after leaving Macedon. Elizabethe and I cleaned up the basement a little. PPA Super Monday is coming in about a month and we better have the classroom all prepared. This entry was posted in Beckwith Mansion & Estate, New York, Palmyra, New York and tagged 2009, Autumn, Beckwith Mansion, Brent, Brent Walton, db walton, Elizabethe, Monday, New York, Palmyra, photographs, photography, Poison Ivy, Trees on September 28, 2009 by dbwaltonm. I couldn’t resist at WalMart the other day. Chocolate chips were on sale so I bought a bag of milk, semi-sweet and dark chocolate chips. 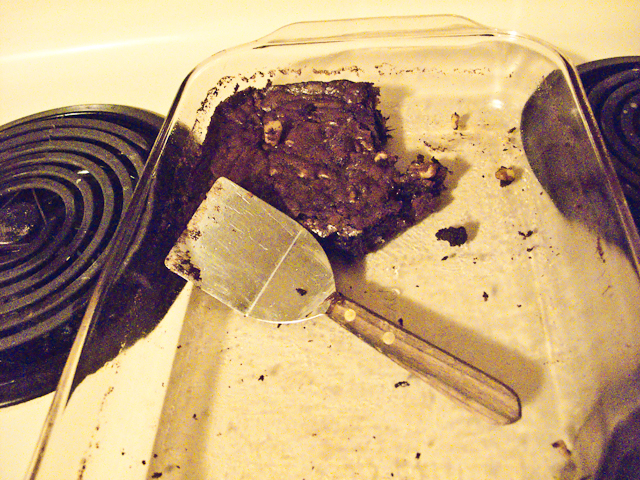 Well, today, I broke down and made brownies and put all three types in as well as walnuts. I left for church early so I could practice the organ. When I was a kid I called them “oregons”, and now I’m the ward organist. Go figure. It turns out Kathy Hill was prepared to play today so I relinquished the opportunity to her. All of the young sister missionaries sang, “Lord I Would Follow Thee”. These young missionaries are amazing. Again, they proved it with their singing. After church, I cooked up some green beans, hamburger, oyster sauce and served it over steamed rice. The elders had brought home a huge box of green beans. Elder Flynn was saying there’s a whole 80 acres of them that are going to get plowed under. Elizabethe suggested the bring home more and she’d blanch and freeze them. Next, Chris Loren and I went home teaching at the Nichols’. They live on Route 21 not far from the Palmyra Inn. I gathered from the visit that the Nichols and the Lorens are good friends. This entry was posted in Beckwith Mansion & Estate, Latter-day Saints, New York, Palmyra, New York and tagged 2009, Autumn, Beckwith Mansion, Brent, Brent Walton, Church, Elizabethe, Estate, Latter-day Saints, LDS, Missionaries, Mormon, New York, Organ, Palmyra, photographs, photography, Sunday on September 27, 2009 by dbwaltonm. I had an 8 a.m. portrait session today. The Hamblin Family. They have 3 adult children, and two of them had their spouses. We met at the Smith Farm for some photos. It was a very beautiful, crisp, fall morning. I loved it. So, I took a walk through the grove and stopped at my favorite place. Sat for a while and pondered the events that took place there. Using my iPhone, I pulled it out and got a GPS reading on where in the grove I was. I found it very interesting that I was directly behind the temple (see above photo) . Now, I could not tell that I was, because of the trees, but with the GPS screen in photo mode, I could see the temple and exactly where I was in relationship to it. Very cool. I came home and worked on the studio and office. I had to rebuild a threshold for one of the office doors. Talk about a lot of work. Discovered carpenter ants in the old threshold. (I’m sure that contributed to its weakening.) The other two thresholds were scraped, and patched and puttied and painted. They look quite nice now. The floor had a crack that ran the full length of the room. I patched it. Patched and painted the doors. And, a lot of small little things that needed to be patched or touched up. Finally, around 3pm I decided it was time to get some client work done. And now, time to do my blogs. What a day. It feels like it has been two days worth of work crammed into one. This entry was posted in Beckwith Mansion & Estate, Latter-day Saints, New York, Palmyra, New York and tagged 2009, Autumn, Beckwith Mansion, Brent, Brent Walton, Building, Church, db walton, dry house, Joseph Smith, Latter-day Saints, LDS, Missionaries, Mormon, New York, Palmyra, photographs, photography, Sacred Grove, Temple, Trees on September 26, 2009 by dbwaltonm. I heard from an old friend, Jared Budge, today. Actually, Jared was one of my Boy Scouts the first time I was Scoutmaster. I later got re-acquainted with Jared when he was all grown up and we used to mountain bike ride. Jared called to tell me of a company that might distribute my LDS oriented work. I got another call from a board member for PPSNYS regarding my speaking at their conference, and other workshop and speaking opportunities. We talked about possibilities and opportunities. This was on top of a normal work day. I threw some lentils in the crock pot and made a soup. It was more like chili made with lentils. Elizabethe liked it, but the missionaries loved it. I think we had about one cup left over. Elizabethe and I rented a Red Box movie – It was something like Race to Witch Mountain – pretty lame and corny. This entry was posted in Beckwith Mansion & Estate, Palmyra, New York and tagged 2009, Beckwith Mansion, Brent, Brent Walton, db walton, Elizabethe, New York, Palmyra, photography, PPSNYS on September 25, 2009 by dbwaltonm. 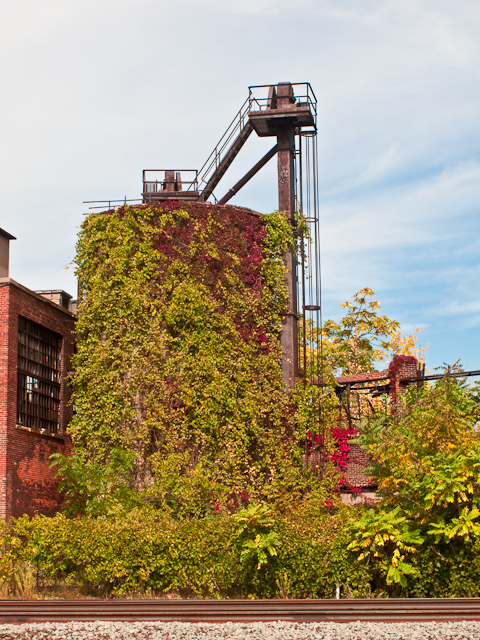 I found an old abandoned building with woodbine growing all over a tank. I’m going to attempt to capture images of it as fall sets in. Keep watching my blog for the next few weeks so you can watch the change. 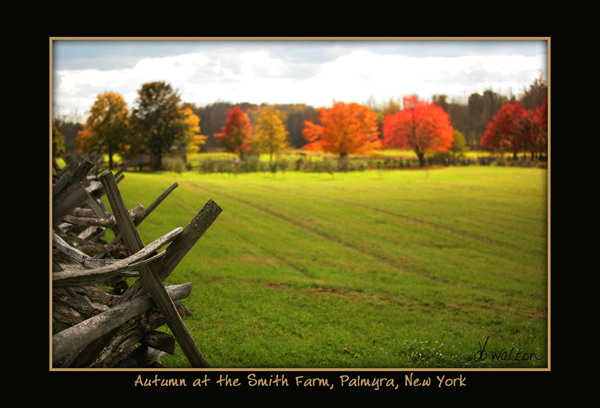 If you have not visited Palmyra in the fall, you need to do it. Sure, if you are LDS, or have an interest in seeing the Hill Cumorah Pageant, you’ll want to be here for the summer. But, if you’ve seen the pageant, and want to see some spectacular sights, come in the fall. 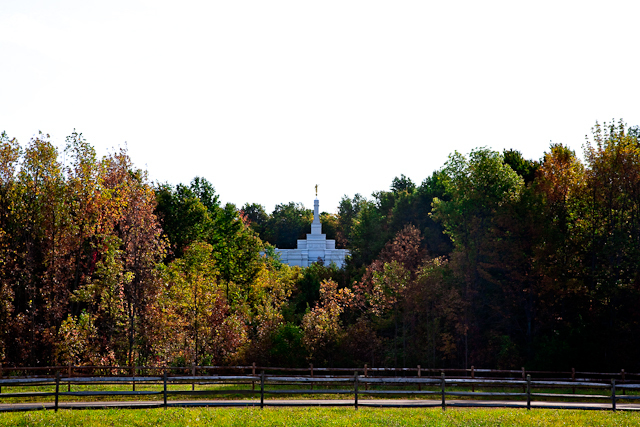 You can’t imaging how beautiful the Sacred Grove is in the fall. The view from Hill Cumorah is breathtaking. To drive around these rolling hills, you will be amazed at the the beauty. It is truly a wonderful place to be. Of course, every season here is beautiful. That was one of the reasons we moved here. Elizabethe wanted lots of trees, and we’ve got them here. I am looking forward to the fall, and the winter that follows. This place is a place of four seasons and each one is a gem in itself. This entry was posted in Beckwith Mansion & Estate, Latter-day Saints, New York, Palmyra, New York, Rochester and tagged 2009, Autumn, Beckwith Mansion, Brent, Brent Walton, Church, db walton, Elizabethe, Fall, Hill Cumorah, Joseph Smith, Latter-day Saints, LDS, Main Street, Mormon, New York, Palmyra, photographs, photography, Sacred Grove, Summer, Trees on September 24, 2009 by dbwaltonm. Isn’t it amazing how nature knows when fall starts? Here it is the second day of fall, and the colors of the leaves are noticeably different than they were yesterday. I’m sorry to say that I was not able to get any pictures today due to a full schedule, but check back frequently this month for some spectacular images. 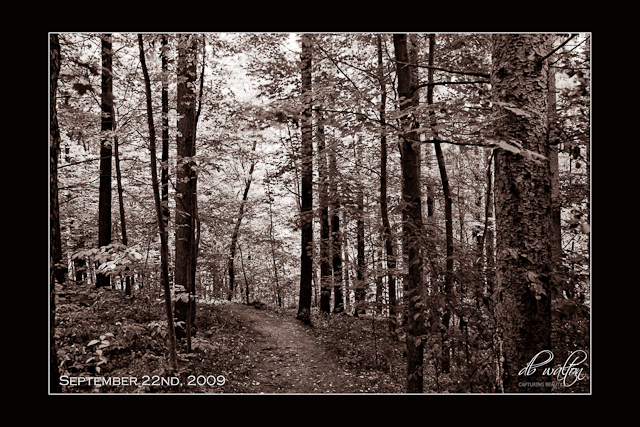 This entry was posted in Beckwith Mansion & Estate, New York, Palmyra, New York and tagged 2009, Autumn, Brent, Brent Walton, db walton, Fall, New York, Palmyra, photographs, photography on September 23, 2009 by dbwaltonm. I’ve been watching the leaves to see when they start to turn colors. Today, I noticed a dramatic change over yesterday. 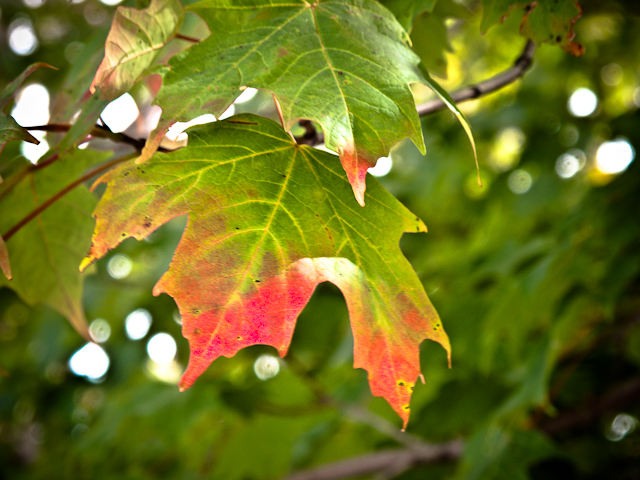 Many maple trees have a few red leaves. My elm tree has yellow leaves and they are dropping. My burning bush is red on top. It’s exciting to see the changes. Summer is over. 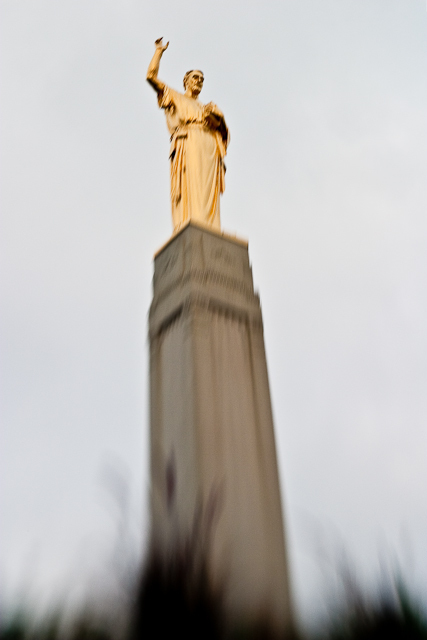 Today is the anniversary of Joseph Smith receiving the gold plates. It was just past midnight on the morning of September 22nd, 1827, that Moroni allowed Joseph to remove the plates and other artifacts from the stone box where they lay hid for over 1400 years. I took the trail (see photo above) to the top. I thought about how Joseph was so familiar with the hill that when Moroni described the place, Joseph knew right where it was. He must have spent time logging the hill with his father, or playing up here. I met the Luedtke family from Southern California. I also met a couple from Bountiful, Utah. 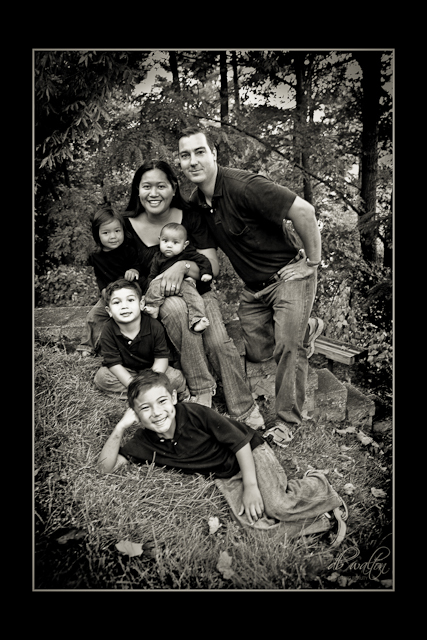 The Luedtke’s asked me to take a photo of their family, which I happily obliged. This entry was posted in Beckwith Mansion & Estate, Latter-day Saints, New York, Palmyra, New York, Politics and tagged 2009, Autumn, Beckwith Mansion, Brent, Brent Walton, California, Church, db walton, Estate, Hill Cumorah, Joseph Smith, Latter-day Saints, LDS, Mormon, New York, Palmyra, photographs, photography, Summer, Trees, Tuesday on September 22, 2009 by dbwaltonm. I think this is the driest I’ve seen this area. We haven’t had a lot of rain, and portions of the lawn are starting to turn brown and dry. But, that’s supposed to change starting tonight. Ah, yes. More rain. I love it. We had dinner at Happiness Garden. While I was there I checked out the door Jim put in. He did an excellent job. It looks very nice. As this is the last day of summer, I bid it farewell. The days will now be shorter than the nights, and less sunlight will be the trees will begin to turn gold, orange, red and crimson. I will take pictures. This entry was posted in Beckwith Mansion & Estate, New York, Palmyra, New York, Restaurants and tagged 2009, Beckwith Mansion, Brent, Brent Walton, db walton, Garden, Happiness Garden, Monday, New York, Palmyra, photographs, photography, Summer, Trees on September 21, 2009 by dbwaltonm. Canaltown Days were going on today, but I don’t participate in those activities on Sundays. So, on the way home from church, they had Stafford road blocked off. We drove a block over, and came down to Main Street, and it was blocked off too. Now, keep in mind that the parade was yesterday. We asked the office if we could get through since we only lived a block down the road. Instead, he wanted us to go east and come on to main heading the other direction. We did as directed, only to find they were not using that section of Main Street for anything. Very strange. Chris Lauren and I did some of our home teaching today. (In the Church of Jesus Christ of Latter-day Saints, families are visited each month by two priesthood holders. The purpose of the visit is to check on the welfare of the family and to instruct them.) 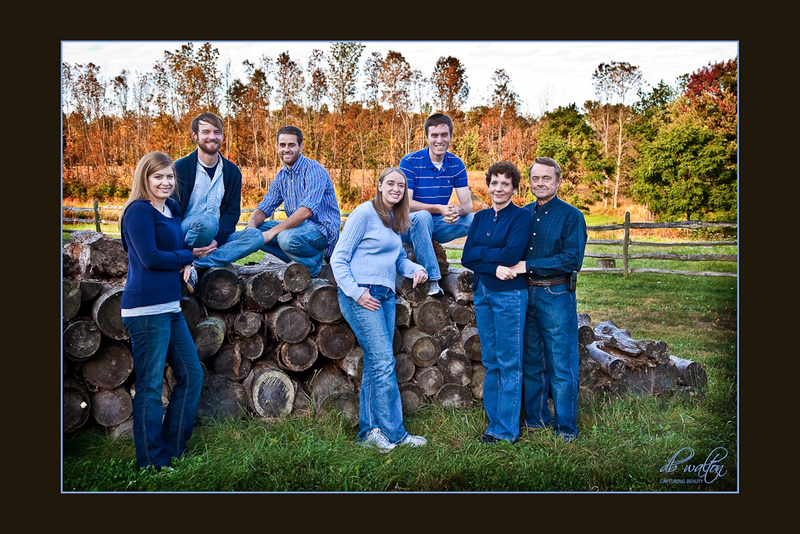 We have 3 families – the Green’s, the Scott’s and the Nichols’. We visited the Green’s and the Scott’s. Being new to these families, we spent the time getting to know them. The Green’s are both from this area. Bro. Scott is from Southern California, and his wife is from the Buffalo Area. Both families are delightful and it is going to be fun home teaching them. At church I was sustained as the ward organist. This is in addition to being the Primary Pianist. There is nothing like using the tallents God has given you. It is rewarding and fulfilling. I just hope I don’t fat-finger too many notes when I play. This entry was posted in Beckwith Mansion & Estate, Latter-day Saints, New York, Palmyra, New York and tagged 2009, Beckwith Mansion, Brent, Brent Walton, Church, db walton, Latter-day Saints, LDS, Main Street, Mormon, New York, Organ, Palmyra, photographs, photography, piano, Summer, Sunday on September 20, 2009 by dbwaltonm.